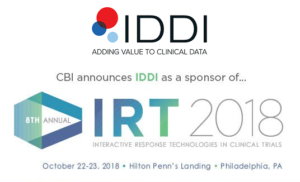 The IRT continues to gain momentum as a critical component to clinical trial and supply chain strategy, and as the complexity of trials continues to rise, creating efficiencies and optimizing the Interactive Response Technology is paramount. Interactive Response Technology needs to be built and deployed rapidly, so that your clinical trial can start faster. To reach that speed, you need a user-friendly and state-of-the-art IRT platform that combines a fast set-up time with the flexibility of customized programming. We’ll be giving demos of our robust and configurable Interactive Response Technology system ID-net at our booth! ID-net™ simplifies randomization by using an IRT and minimizes treatment allocation bias by using its proven statistical methodology. We take advantage of our validated technology and our expertise in biostatistics to implement any randomization or treatment allocation scheme. ID-net™, IDDI’s in-house developed Interactive Response Technology or Interactive Web Response System (IWRS) dedicated to randomization and treatment allocation, and its optional functionality for drug-supply management (ID-supply™), are integrated in our EDC system. This allows users (investigators) to access both functionalities using single sign-on (one single login and password). ID-net™ is designed and validated to manage the algorithms required for a variety of randomization algorithms. It can be easily plugged into various EDC solutions and drug-supply distributors’ systems, and is adjustable throughout the study with no downtime.